1. What do we need to bring? Beach towels, flashlight, properly fitting PFD'S coffee filters, personal bar soap. We welcome one, well behaved pet per cabin, no "barkers" please. Guests planning to bring a pet must inform at the time of making a reservation. All of our cottages are non-smoking. 4. Where can I get a fishing license? 5. What kind of fish are there in Gloucester Pool? 6. When are the kayaks, canoes, paddle boards and peddleboat available? Guests may take them out at the dock whenever they want provided that they use the supplied safety equipment that is required. 7. What are check-in and check-out times? Check-in time is 4 pm on your day of arrival and check-out time is 10 AM on the day of your departure. 8. What is the closest town to buy groceries? Coldwater is located 20 minutes away off Hwy. 12 and has a Foodland Grocery store as well as a LBCO. 9. What is the requirment for operating a rental boat and motor? One must have an Ontario Pleasure Craft Operators card or its equivalent. 10. Do you have a fire pit or allow campfires? 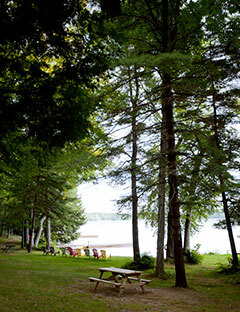 Yes, there is one central fire pit for all four cottages and a supply of firewood is provided for camp fires. 11. What do you accept for payment of my account? We accept Canadian/US cash, certified cheques, or e-transfer, Visa, or Mastercard. We do not accept personal cheques unless prior credit is established. All US cash is figured on the current rate of exchange. 12. Do we need to bring our own lifejackets? We do have some lifejackets, but if you have small children, we advise that you bring your own, properly fitting PFD'S for maximum safety. 13. Where can we get bait? Bait can be purchased either from Severn Lodge or Big Chute Marina. .
14. Are there phones at the cottages? No, there are no phones at the cottages, however there is good cell phone coverage. 15. Where are laundry facilities in the area? Severn Suds located about 10 minutes from Logpointe in Port Severn directly across from the Muskoka Tourism Information Centre.